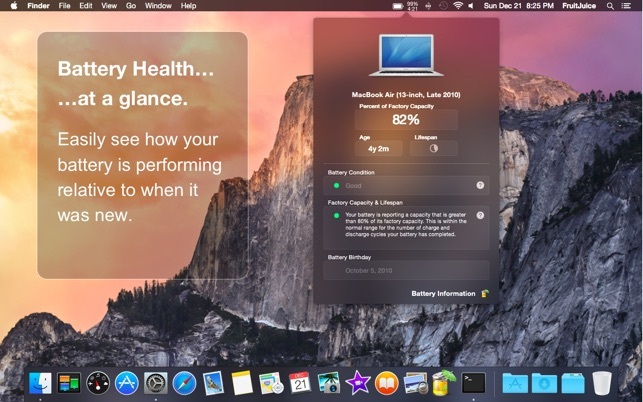 FruitJuice helps you achieve the longest runtime and lifespan from your Apple notebook battery. 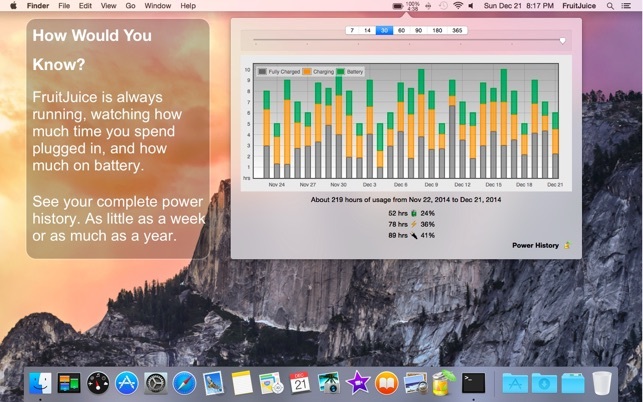 FruitJuice keeps a detailed record of your battery charge and discharge activity so that it can make precise recommendations about how long to use your machine on battery based on Apple's recommended usage patterns. Recommendations are tailored to your specific usage patterns and are adjusted in real-time based on how you actually use your machine. Flexible configuration allows you to see as much or as little information as you wish. 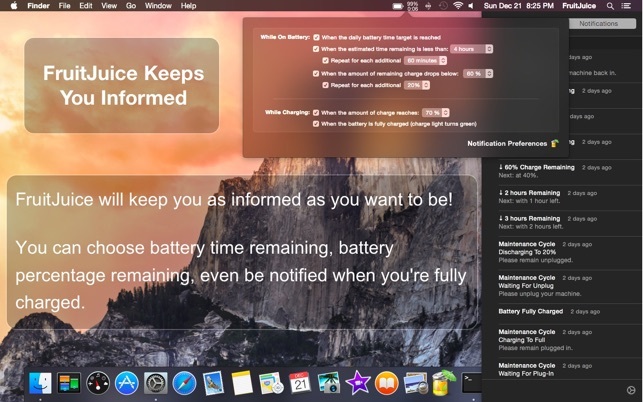 Notifications will let you know when to plug in or unplug your machine to keep your battery healthy and avoid the surprise of "You are now running on reserve battery power." 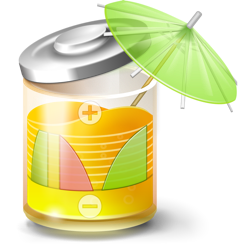 FruitJuice also will show you a realistic assessment of the overall condition of your battery: it combines the battery condition, age, factory capacity and lifespan numbers to give you real-time insight into the health of your battery. I have known for a long time that I need to care for the battery in my laptop. And for a long time, I followed an Apple suggested practice of completely running my battery down, letting it sit, uncharged, overnight and then fully charging it the next day. But my reminder to do that came at a time I couldn’t afford to go without my computer so I’d put it off and ultimately forget. Then I was in a situation where I could leave my laptop plugged in almost constantly so I did. But it seems, I killed that battery. Well, at the time I got a new MacBook Pro, I heard about Fruit Juice on the MacBreak Weekly podast and thought I’d give it a try. It’s super simple to use (provided you can follow on-screen directions). I’ll also mention that I had reason to reach out to the developers and recieved a quick and helpful response! A Fruitjuice user for some time, it just occurred to me that what the durations of what I had presumed had battery life is not, in fact, the case. My MacBook Pro had been left plugged into the charger at 10PM last night. About 15 minutes ago (2:00PM the next day) I decided to use the laptop, removed it from the charger and powered it on. I then opened FruitJuice’s “Power History” from the menu bar. Instead of seeing the actual time on battery power–––in this case less than a half hour–––the graph depicted 4 hours after charging had completed, giving the misimpression that the laptop had not only been powered on but had been either in use or in sleep mode. I consider this to be misrepresentation. I brought this app and I’d tried it for couple of months. I found this app is far from keeping you bettery healthy. Otherwise, it kills your battery faster than you think. 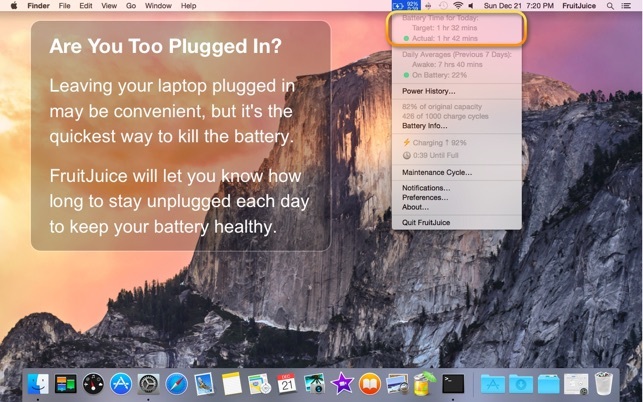 First, this app says: don’t plug your macbook all the time. and it give a length of unplug time as a instruction. Every time I follow this instruction, I found that no matter how faster the power consumption is was, the unplug time is fixed. For example, the suggested unplug time is 1hour and 30 Mins, even if I were play a highly power consumption Game like DiabloIII. After 1.5 hours gaming, my battery will definitely drain out. I don’t really think it will protect my battery, on the contrery, It will only increase my battery cycle time. You are correct that FruitJuice currently looks at overall usage time and makes a time-based recommendation. Some people find that a monthly maintenance cycle (which you can start from the FruitJuice menu) is better suited to their usage patterns. Please feel free to contact us at support@fruitjuiceapp.com if you have other concerns/questions regarding FruitJuice usage or battery best practices.